The Simplest way to track your Steps and be More ACTIVE! Your Simple Motivator in Achieving your Fitness Goals, great for Men, Women, Kids and the Elderly - Simple to use out of the package, just pull the battery insulator tab out of the back, wear it around your neck or place in your pocket or bag and you are ready to go! Designed with simplicity and ease of use for everyone that wants an accurate Step Counting 3D Pedometer. No Bluetooth, downloads or smartphone connections required. With it's simple single step counting function you can view your step record on the move. 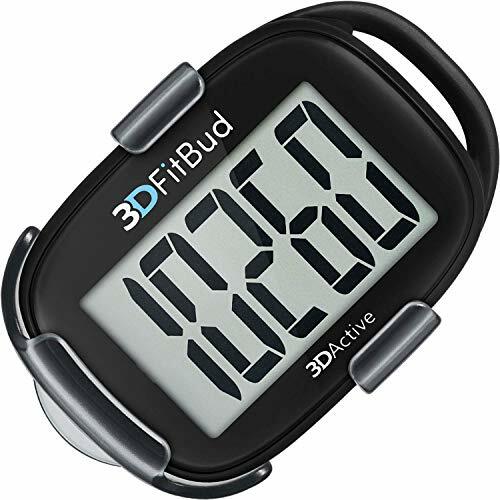 For the best accurate step count and to avoid counting sudden movements as steps, the 3DFitBud Simple Step Counter will not count any movement that is less than 10 consecutive steps. Once you have walked 10 consecutive steps the step counter will then begin counting 11, 12, 13... . To ensure accuracy, the 3DFitBud is best used for continuous and consistent walking and is not recommended for use with walking aids. SIMPLE & EASY TO USE - 3D Pedometer for Steps Only. It is ready to use straight out of the package. The simple feature and design makes it user friendly for men, women, kids & the elderly who want to track their steps and stay motivated towards achieving their fitness goal. It´s the simplest pedometer to start with, if you don't want complicated set ups. TRACK YOUR DAILY STEPS - Created with simplicity but effectively counts your steps so you can still view your progress on the move motivating you more to achieve your fitness goal. No more other complicated programs, just press the button at the back to start with. ACCURATE READING - It has advanced 3D Tri-Axis Sensor technology - much more accurate than most pedometers. 3D Tri-Axis Sensor technology is known to provide superior accuracy in reading steps in any position - up, down, flat on its side, or any angle. Multiple wearing options - Clip to your pocket or hip, wear around your neck or place in your pocket or bag. EXTRA LARGE DIGIT DISPLAY - With full screen display you can clearly and easily read the numbers at a glance. BATTERY INCLUDED - Enjoy Great Battery Life. Pedometer auto sleeps when you are not moving and auto wakes and counts steps when you start moving again. If you have any questions about this product by 3DActive, contact us by completing and submitting the form below. If you are looking for a specif part number, please include it with your message.